"The absolute,” La Maga was saying, kicking a pebble from puddle to puddle. “What is an absolute, Horacio?" 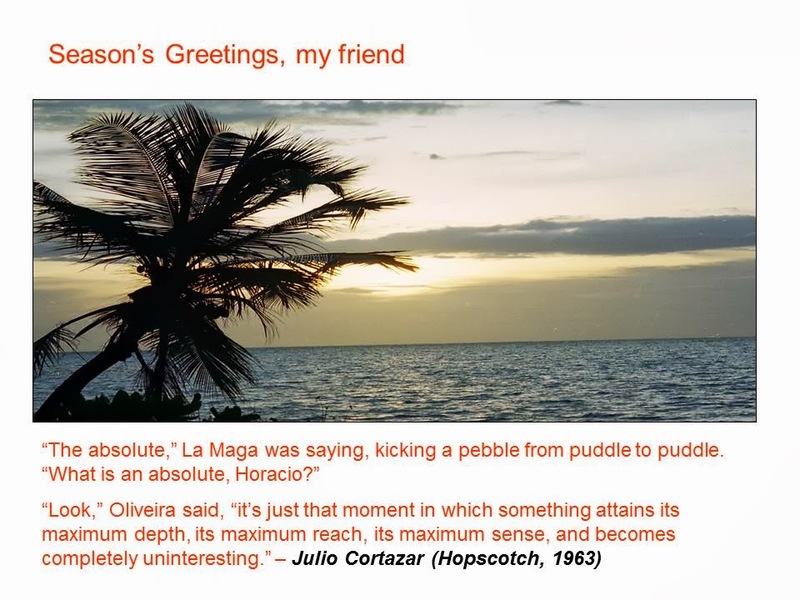 "Look,” Oliveira said, “it’s just that moment in which something attains its maximum depth, its maximum reach, its maximum sense, and becomes completely uninteresting." I had used this piece of dialogue from Hopscotch in a greeting card I had made about a decade ago. Re-reading a novel often reveals hidden aspects about the book, the characters that one misses during the first reading. Of course, one doesn't have the luxury of reading all the books one reads twice, but I often have felt that I should make time to again read some books that I have enjoyed in the past. Julio Cortazar’s Hopscotch (1963) wasn't on that list because I hadn't enjoyed the book the first time in 1984 - the year Cortazar died (that was nearly two decades after it was published). I had tried reading it both the ways – from page 1 to the last page, and then the author recommended way of starting at chapter 73 and then moving on to 1, then 2, then 116…playing a hopscotch with the narrative. It was indeed innovative, but that was about it. I found the book heavy, laced with too many references to jazz, a subject I was (and am) quite unfamiliar with, and I just couldn't comprehend the reason of Horacio’s (the lead protagonist) angst, and found inexplicable Horacio’s rootless existence, his initial disdain and subsequent longing for La Maga, his infatuation for Talita, his unwillingness to get a hold on himself. While these were all deftly depicted, they failed to come together as a composite narrative. Also, in 1984, I didn't know that Julio was pronounced with an ‘H’. In 2009 a friend (who has since disappeared) corrected me: "It's pronounced Hulio." A few months ago I began to re-read it, not in the hopscotch pattern suggested by the Cortazar but from page 1. I found it riveting. Many aspects of the characters that I couldn't fully grasp when I was younger made perfect sense to me now. I still had some issues with the section ‘From Diverse Sides The Expendable Chapters’. But I could easily relate to the broad the themes of alienation and exile, even if at times, I felt like shaking Horacio’s shoulders and just telling him to get on with it. Written in a stream of consciousness style that was popular in the mid-twentieth century, it belongs to the antinovel genre where chronology is deliberately jettisoned by the author to create a surreal narrative that doesn't rely on a story or a plot but carries it forward primarily through the interactions between the main characters. How often I wonder whether this is only writing, in an age in which we run towards deception through infallible equations and conformity machines. But to ask one’s self if we will know how to find the other side if habit or if it is better to let one’s self be borne along by its happy cybernetics, is that not literature again? Rebellion, conformity, anguish, earthly sustenance, all the dichotomies: the Yin and the Yang, contemplation or the Tätigkeit, oatmeal or partridge faisandee, Lascauz or Mathieu, what a hammock of words, what purse-size dialectics with pajama storms and living-room cataclysms. The very fact that one asks one’s self about the possible choices vitiates and muddles up what can be chosen.